This year has been another fantastic year for bike-sharing around the world. In my most unscientific calculation I have counted there to be about 238 bike-sharing services around the world, up from about 160 last year, for a 49% increase. On top of this, there are another 53 services that are in planning stages and may come online soon. Vcub(e) (Bordeaux, France) pushed the edges of 3rd generation bike-sharing by integrating with the region’s other transit systems such that the same RFID card could be used on any transit system. Mexico City repealed its bike helmet law before the launch of Ecobici, however, Melbourne did not, which has limited the public’s uptake. Although, Melbourne Bike Share is experimenting with helmet vending machines and helmet sales at convenience stores for which we wish them good luck. India and Iran got into the bike-sharing game with Bike House and FreMo, respectively, operating modified 2nd generation services. Good for them. This proves there’s no one right answer for each challenge. Barclays Cycle Hire (London, England) launched earlier this year with great fanfare as Barclays provided £25 million to sponsor the service, lending its name and covering the city with 6,000 blue bikes. Their safety and usage videos are to date the best I’ve seen yet. Maybe their next video will have Prince William and Kate narrating. Velib’ (Paris, France) turned 3 years old this year and hit its 80,000,000th trip. I remember the good old days when it had hit its 1,000,000th trip. Ahhh, memories. 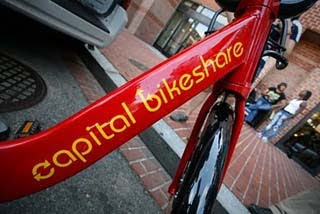 The first large-scale bike-sharing services in the U.S. with the launches of Nice Ride Minnesota (Minneapolis, Minnesota, USA), Denver B-cycle (Denver, Colorado, USA), and Capital Bikeshare (Washington, D.C. and Arlington, Virginia, USA). Each trying to out-do the other, the each launched a couple of months from each other with more bikes and stations. As you can see, it’s been quite a busy year in the bike-sharing world. Here at The Bike-sharing Blog we had about 80,000 visitors this year and The Bike-sharing World Map has had over 760,000 views since its inception over three years ago. At nearly 300 listings of services which are either running or on their way, the Bike-sharing World Map has gotten a little wieldy as we’re pushing the edges of what a Google Map can do. We at MetroBike, LLC have had a good year ourselves with the work we’ve accomplished and the many projects were working on. The movement to get people riding is just beginning to roll. There’s still so much to do to change the path the world has been heading down. Bike-sharing, along with many other innovative, green ideas, will be the change the world must see to improve ourselves. The Bike-sharing Blog co-authors, Russell Meddin of Bike Share Philadelphia and I, wish you a happy and healthy 2011 with lots of bike-sharing. We look forward to the upcoming year and all the exciting things we have yet to learn, experience, and share on The Bike-sharing Blog. We’ll keep you posted, so you keep us posted too about what’s going on in your part of the world. Taking a brief break to get some exercise before his long flight to deliver gifts, Santa, or make that Santas, borrow "Boris Bikes" in London for some jovial riding around town. Warning: As this video depicts more than one Santa, it should not be viewed by children younger than 12. The City Council of Dublin, Ireland yesterday approved a tenfold expansion of the Dublin bike-sharing program from 500 to 5,000 bikes, according to the Irishtimes. The wildly successful Dublinbikes is one of the most popular bike-sharing systems in Europe. Many of the current 450 bikes are being used around 10 times a day. The approval foresees the expansion over five years. 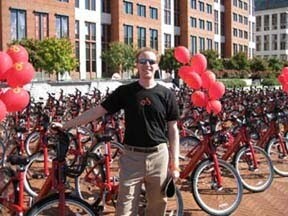 The number of bike stations will grow from today's 40 to nearly 300. 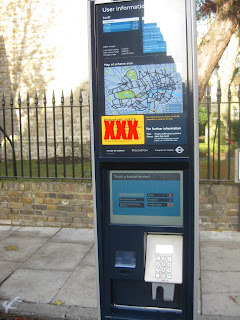 The JCDecaux system in operation since September 2009, has signed up more than 47,000 subscribers. That is over 100 subscribers per bike. By comparison Paris has around 8 per bike and Washington, DC around 5 subscribers per bike. 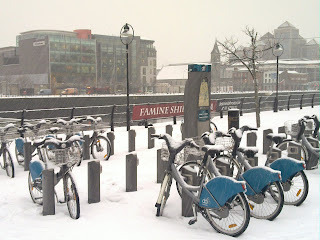 For many of those Dublinbikers, even with the snow, 5 years can't come soon enough! This morning, after four months of operation for locals, London’s extremely successful Barclays Cycle Hire will be open to users from all around the world. 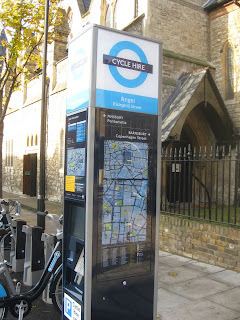 On December 3rd Transport for London (TfL) starts allowing non-United Kingdom residents to hire a "Boris Bikes." A casual user, anyone over 14 years of age, with a Visa or Master Card (American Express need not apply) can now walk up to the kiosk at any station to get a bike. Yes, even Master Cards and Visas issued in the USA will work! There are easy to follow the instructions available in multiple languages on a large video screen at the kiosk. Pay the £1 fee for 24-hour access with your credit card. Like the similar systems in Montréal, Minneapolis, Melbourne, and Washington, the terminal prints out, on paper, a cycle release code for each cycle. A new release code is needed every time you take out a bike; the system remembers the credit card and at no extra charge within 24 hours issues the new release code for each time. Make sure that your cycle is roadworthy, a seat turned around, is the universal bike-share signal that there is a problem! Compose the cycle release code at the docking point. The light will turn amber while your code is verified, then wait for the green light and then pull out your cycle. Like most systems the first thirty minutes are free, then the next 30 minutes is £1, then the price really escalates. Do not keep it too long because two hours will cost £6 and three hours £15. So make those rides short. If you come to a station that is full and you can’t return the bike. Use the kiosk to locate the nearest empty docking point and get an extra 15 minutes for free to find it. Although there isn’t a location map on the screen yet, there are good maps on each kiosk. The station location map is on-line here and there are various smart phone applications. On a nice day, many of the 6,000 bikes are in use, especially during rush hour. In the morning they are hard to find near the railways stations and at night those stations are full! TfL is building a 124-docking point station at the Waterloo Railway Station to keep up with the demand which could be the largest station in the world. Because of the success of the system, over 1.8 million usages in 4 months, there are plans, announced in November, to expand the system into the eastern part of the city with another 2,000 bikes by 2012. According to James Mead, Barclays Cycle Hire Operations Manager, there are over 100,000 UK residents subscribing to the system with RFID “keys” which allows access to the bikes. Around 35% of these are annual members and 60% are daily members. The rest are weekly. He expects these new "casual users" to make up around 10% of the total ridership. Currently, there are around 20,000 trips every weekday made on the Boris Bikes and 10,000 on the weekend days. With these usage numbers and such successful public acceptance of the program, analysts are projecting it is on course to become the only TfL system to make an operating profit, according to the newspaper, The Guardian. Enjoy your ride in London! By the way you do not need to bank at Barclays to use the Boris Bikes. Keep in mind that in London you ride a bike on the left! Try to use the green bike lanes or the blue "Barclays Cycle Super Highways" lanes as a reminder on which side of the road to ride. Don't forget, the front brake is on the right and the rear on the left! Update: According to the Evening Standard, the first day of "casual use" of Barclays Cycle Hire was fraught with computer glitches and bad weather. Many kiosk crashed when implementing the added service. It was necessary for technicians to correct the problems on site by rebooting approximate 100 kiosk of the effected stations. It is operational now.